Fortified manor house 14th century Ruined Only the tower remains of a C14 fortified manor house built by the de Cantelupes. Keep and bailey 12th - 14th centuries Ruined Cadw Prominently sited above Heol West Plas, Coity Castle was founded in the early twelfth century and was granted to the Norman family of Turberville. Keep and bailey 12th century Fragmentary remains The scanty remains of Kenfig Castle, a once great medieval fortress, rise from the dunes beside the Cynfig river. 12th century Fragmentary remains At Llangynwyd the remains of a once splendid medieval fortress are now reduced to scanty ruins and earthworks. Enclosure castle 12th century Ruined Cadw The castle's most outstanding feature is its complete Norman doorway, which greets the visitor approaching the castle from the south. Concentric castle 13th - 14th century Ruined, with partial restoration Cadw Caerphilly is the largest medieval castle in Wales and one of the most impressive in Europe. Mock castle 17th century Ruined Private Built c1626 by Sir Thomas Morgan, steward to the Earl of Pembroke, and the latest example of the Elizabethan and Jacobean court taste for castellated mansions. 13th century Fragmentary remains Castell Morgraig was built by the Anglo-Norman de Clare lords of Glamorgan, sometime after 1243 and before 1267, when it was abandoned unfinished as the de Clares defeated the last Welsh native lord in the area and started building Caerphilly nearby. Shell Keep 11th century Ruined, with partial restoration Cardiff Council Cardiff Castle was established within the walls of a mighty Roman fort by William I of England in about 1081. Gothic Revival 19th century (Originally 11th century) Intact Cadw Castell Coch, located on a prominent wooded hillside overlooking the Taff Valley and the northern part of Cardiff, is a remarkable blend of solid medieval masonry and High Victorian Gothic fantasy. Enclosure castle 13th century Ruined National Museum Wales The remains of the medieval castle at St Fagans include the southern part of a stone curtain wall. The enclosure is currently overlain by an Elizabethan mansion, with part of the surviving curtain serving to define its forecourt. Enclosure castle 13th century Ruined Cadw Magnificently set castle, high on a limestone precipice. A vaulted passage runs from the SE corner to a cave below E outer ward. Shell Keep 11th century Ruined Carmarthenshire Council Remains of the high medieval castle, including a shell keep, gatehouse and two towers, are obscured by modern buildings, notably County Hall. 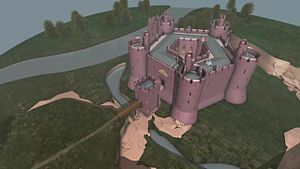 12th century Cadw Dinefwr castle is thought to have been founded in the later twelfth century by Rhys ap Gruffudd, the Lord Rhys, and became known as the traditional capital of Dyfed. 13th century Cadw The shattered ruins of a medieval castle crown the ultimate summit of a dramatically isolated and abrupt hill rising from the Tywi floodplain.